But when I checked my escarole seed packet, it said "Batavain Full Heart Endive." Now I was not only confused, but also afraid of handing out erroneous information to would-be escarole growers and eaters. I was sure that I had been growing escarole and endive for years. And after a little research, it turns out that I was right. But so was Clare. Escarole is, according to some helpful Lecture Notes On Leafy Vegetables I found online, "a selection of endive," and is also known as Batavian endive. That explained a lot. 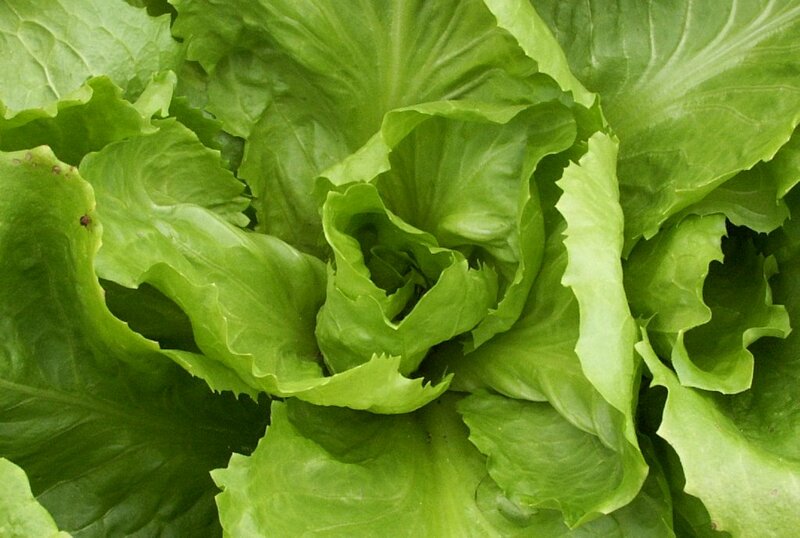 Native to the eastern portion of India, endive and escarole (which have the same growing requirements) reached the Mediterranean regions by the time of the ancient Egyptians, where they continue to be popular today. 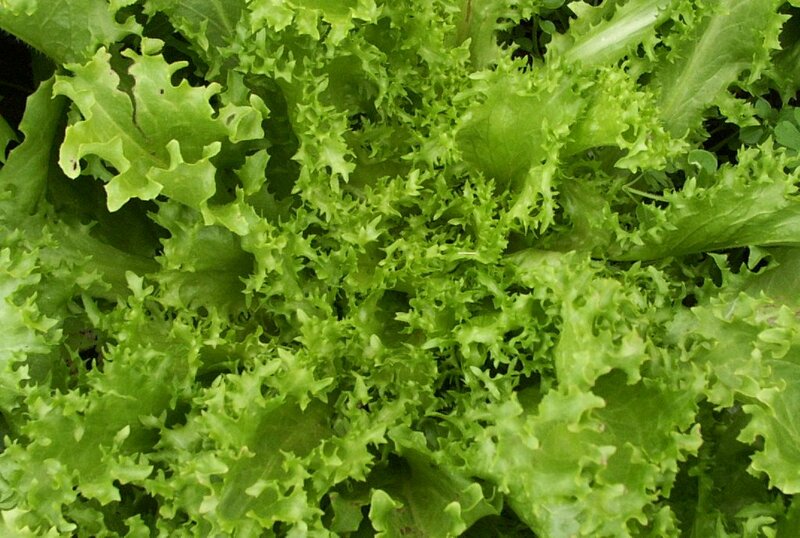 Endive has finely cut, loose, narrow, medium green, fringed, and curly leaves and a very pungent flavor. 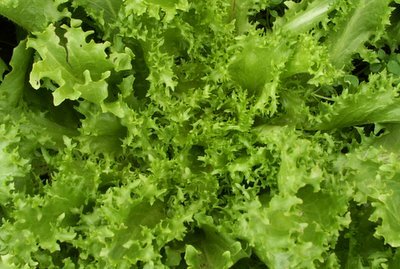 Escarole, on the other hand, has broad, thick, smooth leaves with a white midrib and forms a loose head. While it has a milder flavor than other endives, it can have a hint of bitterness. Endive and escarole (and bitter greens in general), often tend to be an acquired taste. They are both cool season plants that prefer temperatures between 60 and 70 degrees F. They grow well in the spring and even better in the fall. Since we tend to get very warm weather in mid to late spring here, I planted my seeds directly in the garden in September and have been harvesting since October. Endive and escarole can withstand temperatures of 28 degrees F, and the flavors are less sharp when grown in the fall. My plants have survived several nights well below 20 degrees F covered with nothing more than bedsheets and an old quilt (draped over small metal hoops to help keep them from touching the plants). Other than frozen spots on a few outer leaves, they are fine. As a diehard organic gardener, escarole and endive gain extra points in my gardening book since (at least in my experience) they are rarely, if ever, bothered by pests--especially in the fall. While ravenous insects happily feasted on my Chinese greens growing in an adjacent plot right up until our first really hard frost, they virtually ignored the escarole and endive. Another interesting thing I learned during my research was that I am supposed to be blanching my escarole and endive. What is blanching in gardening terms (as opposed to cooking terms)? It is simply the growing of a plant partly in the absence of light. Apparently endive and escarole are considered delicacies when blanched and used for salads or as a garnish. This is because, according to Extension Horticulturist Craig Anderson,* "unless blanched, the spreading plants are likely to be bitter. When sunlight is kept from the center leaves, their green color is reduced, bitterness is decreased, and texture and flavor are improved." 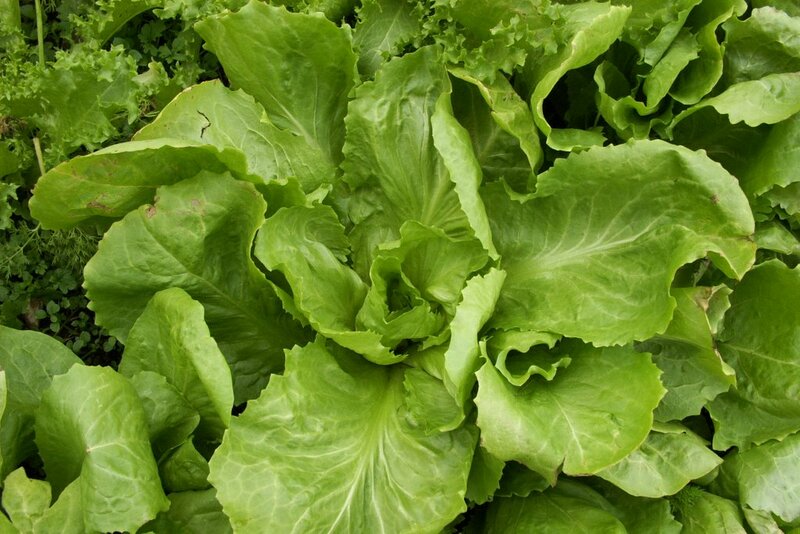 To blanch your endive or escarole, gather the outermost leaves and tie them together when they are about 10 inches long, or when the leaves have spread sufficiently to touch the next plant. Make sure the plants are dry before doing this, or the inner leaves may rot. Blanching can take two to three weeks. During that time, the inner leaves (hearts) will become a cream color. I was intrigued by this practice, as I have noticed that my endive usually tastes fairly bitter. Unfortunately it sounds like the kind of thing I will never get around to doing, but it certainly would be interesting to try some time. Once the leaves are partly or wholly blanched, you can harvest the plants by cutting them at ground level and discarding the tough outer leaves (chicken food!). Since I don't do the blanching thing, I tend to treat endive and escarole the same way I do most other greens in my garden, and that is to harvest only a few leaves at a time from each plant while continuing to let them grow. You'd be amazed by what I've seen bounce back into edible goodness after being completely ravaged by insects or weather or deer. I purchased my endive and escarole seeds (along with all kinds of others) from Baker Creek Heirloom Seeds, a wonderful little family-run company right here in Missouri. What I grew this year (according to Baker Creek) was Batavian Full Heart Endive (which was an AAS Winner in 1934 and is "a superb salad plant"), De Louviers Endive, and De Meaux endive (pictured above). These last two are both the curly type of endive, and they are growing right next to each other. I have stared at them repeatedly and fail to see (or taste) any difference. Both date back before 1885. So what do I do with my harvested endive and escarole? The frilly endive leaves make lovely (and tasty) salads. And while I do toss young escarole leaves into salads as well, its flavor really shines when you saute it in some very nice olive oil, adding lots of chopped fresh garlic during the last minute or two of cooking. But my very favorite thing to do with escarole? Click here to find out. Weekend Herb Blogging, hosted each week by Kalyn's Kitchen, is a fantastic way to learn about culinary herbs and edibles from around the world and discover yummy new food blogs. We'd love to have you join us. Just photograph and write about an herb, plant, veggie, or flower and email Kalyn the permalink by Sunday afternoon. The round-up of all the featured plants is published each Sunday night at Kalyn's Kitchen and is always a delightful and informative read. *Note: Information for this article was also obtained from the University of Arkansas Cooperative Extension Service Arkansas Home & Garden website, which offers a wealth of information on everything from canning to composting. Very interesting. I only have limited experience with growing greens, and usually stick to chard, which is less likely to go to seed when it gets hot. But I do love the sharp flavor of these types of greens. Yours look very healthy. Love escarole...looking forward to recipe. I'd always heard the blanched endive referred to as Belgian endive, so maybe it's a technique that started there or is popular there??? Also, isn't the curly endive also called frisee, in French, I suppose??? I'm going to follow your info links and learn more about this. Thanks. You never cease to educate me! FG, that was very informative. It seems very easy to start mixing up all of the various greens out there, so a little clarification is nice. They look lovely and I am ALL FOR pest-resistant plants! Yes, pest-resistant is super-important, especially in my humid climate. This will make my gardening list, too. Cut the bottom part of the endives, and boil them in salted water, until tender. Add some flour and stir. Add as much milk as you will want to have sauce, a little at a time. Roll each endive in a slice of ham. Place in a rectangular baking dish. Pour the bechamelle over the rolled slices of ham. Sprinkle more Swiss cheese over the sauce. Dot with butter/margarine. Place under the broiler until golden. Taste wonderful with mashed potatoes. (To make mashed potatoes the Belgian way, you also put some nutmeg in with the salt and pepper) I hope you will enjoy these as much as I do. Endives are a little bitter, but cooked they are sometimes a mixture of bitter and sweet. I love reading your web page because you have great pictures and recipes. I enjoy gardening myself. Do you have any recipes for cilantro leaves? I have been growing cilantro the last few years, it reseeds itself, and I am waiting for the tomatoes to ripen to make salsa with it. Thanks for the kind words--so glad you're enjoying my blog. I love cilantro, though I don't have much luck growing it here in Missouri-- at least not when the tomatoes are ready--since it goes to seed so quickly in warm weather. I never knew cilantro was such a cool weather plant until the year I found some volunteers that had sprouted up under the snow! Nice article --- but reading comments from 2005 (it is 2009 as I write this), I hope your readers later discovered that Belgian Endive (the recipe for "chicons" refers to the same plant) is NEITHER of your two plants, but is a Chicory.... Google "Witloof" for the most direct information. These are greens where the root is developed outdoors, the top cut off and the root cellar-stored for winter. Put in moist sand they are forced later, usually blanched by growing in dark under a box lid, and the long, narrow, tight heads cut when about 2" wide and 6" tall. Since I just found this site, I hope to read all of your blogs, having grown up on a sheep farm in Indiana.... no better memories than a raising sheep!! I just found your blog and have bookmarked it. My family joined a CSA for the first time this year, and I'm learning a lot about tons of new greens. This article about endive solved a great mystery for me! The CSA gave us a bag of endive, but it didn't look like any of the endive I could find online, so I was confused. I also bookmarked several of your chard recipes for use with my weekly bags of chard. Thanks for your enlightening and inspiring blog! Oh, I'm a Missourian too...hailing from the SW area. Is there any chance you have photos of the finished product? I am growing these right now (from the same seed supplier) and I am about to tie them up. I am curious as to how they look/turned out!